AUBURN HILLS, Mich.–In a strong indication of its growing presence in North America, Mahindra Automotive North America (MANA) opened a new North American HQ and manufacturing operation in metro Detroit in November, the first such new OEM facility in Southeast Michigan in more than 25 years, the company said in a press release. The expansion is part of a $230 million investment in Southeast Michigan that also includes a recently-opened warehouse and logistics operation in Pontiac and an existing prototype operation in Troy. In total, Mahindra has grown to 400,000 square feet across three Detroit area facilities. Since opening in Troy four years ago, MANA has grown from seven people to 250. By 2020, additional planned projects are anticipated to result in 400 more jobs and another $600 million in local investment over that same period. In addition, MANA will continue to provide Metro Detroit-based engineering support for new vehicle platform development for India and global markets. The new facility will produce an off-highway vehicle that will extend Mahindra’s current position in this growing segment. Designed and engineered by MANA, the vehicle promises to be unlike anything currently on the market, the company said. 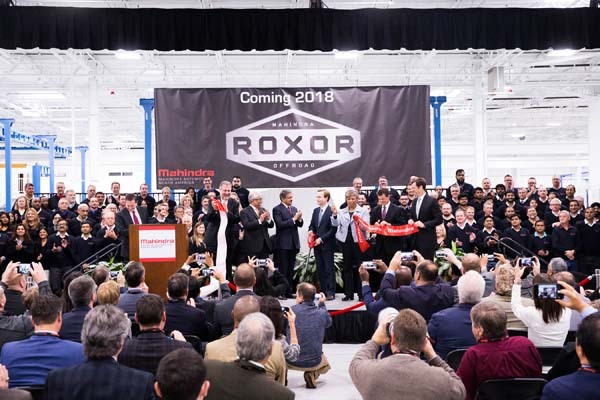 Mahindra Group Chairman Anand Mahindra, Automotive Division EVP Rajan Wadhera, and MANA President and CEO Rick Haas participated in the facility inauguration, along with Michigan Lieutenant Governor Brian Calley and Members of Congress Brenda Lawrence and Dave Trott. The event was also attended by other elected officials, business leaders, and Mahindra employees. "This is an exciting day for Mahindra, our terrific employees, and Detroit," said Anand Mahindra, in a statement. "I couldn’t be prouder to be here to help open this new facility today."